Athena only ever asks to watch three programs on TV. One of them is Bing, and it’s the least objectionable of the choices! I like it because each little episode has a nice moral to the story, and it deals with every issues that a toddler comes across; Sharing, potty training, losing things and bath times! Bing’s House is decorated just like the ‘real’ house and there’s even a Hoppity Boosh (Bing Bunnies favourite toy) on his wall! You get Bing and Flop characters included with the house and can get the other child/adult pairs in the Bing toys range, and we were sent a Sula and Amma set too! I also like that the children are all bigger than the adults, making them the focus of the episode and the adults more of a supporting role. 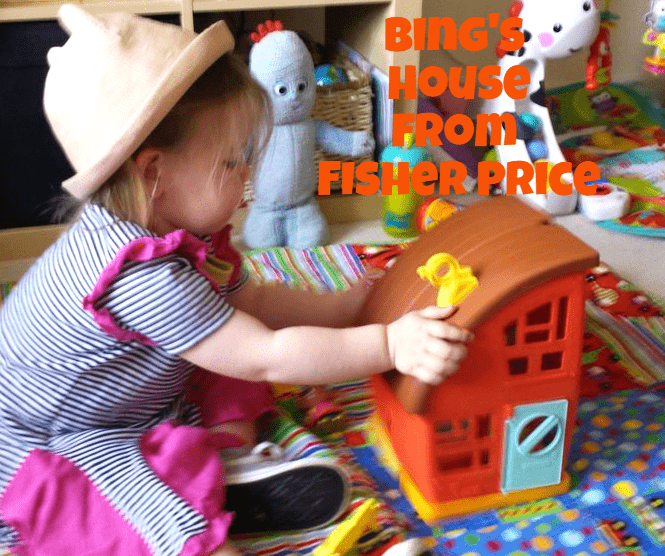 So when a box of goodies from the Bing Toys range arrived for Athena a couple of weeks ago with Bing’s house in it she was over the moon! The house folds shut for easier storage, but you can also access the door when it’s closed to maximise play. There are two buttons on the floor that make different things happen when you pop a character on them and press down, there are also removable interactive items like a bath and a bed that you can pop all the characters into too. Whenever we watch Bing now the house comes out, and she moves the characters around the house with a gleeful look on her face, it really is pretty cute! I’m going to use some of her birthday money to buy her a ‘Pando and Padget’ Bing Figure pack too as they’re her next favourite characters! I’ve had to make sure that Sula doesn’t sneakily leave the house as she tried to take her to Nursery one day last week and I don’t want her to get lost! We were sent these items to review, all opinions and words are my own. That looks like a lovely set, she looks very happy with it and enjoying it very much! Mine are now 6 & 11 so I have never heard of Bing, shows I am out of touch with kids TV now!